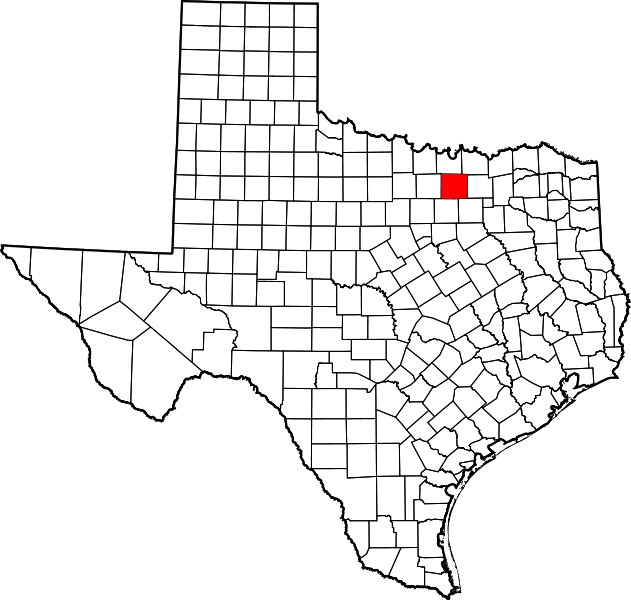 "Denton County covers 911 square miles in north central Texas, [and] ranges in elevation from 500 to 900 feet. "Anglo settlement began after William S. Peters, of Louisville, Kentucky, and several others, obtained a land grant from the Texas Congress in 1841. The land settled by their company, the Texian Land and Immigration Company, became known as the Peters colony. Their grant included all of the future Denton County, as well as parts or all of several other future counties. 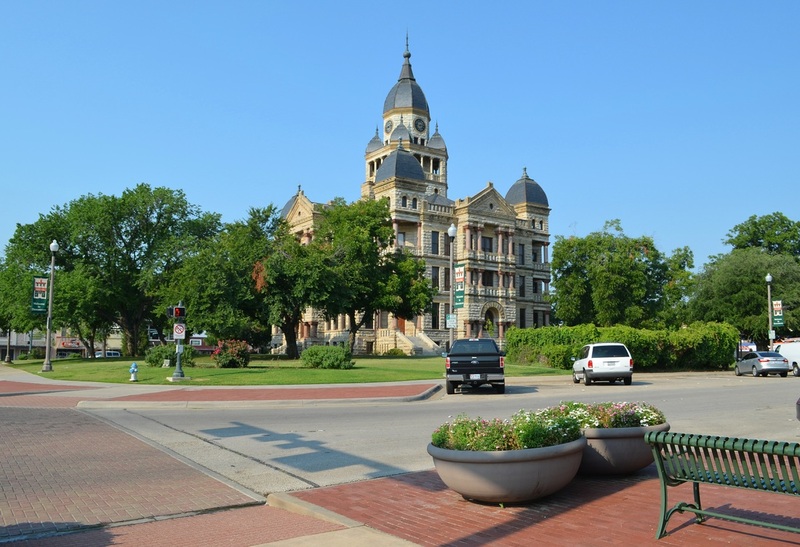 "In 1846, the Texas legislature formed Denton County out of what had been a much larger Fannin County. It was named for John Bunyan Denton, an eastern Fannin County Methodist preacher and lawyer, who was killed in a raid against Indians in northern Tarrant County on May 22, 1841. 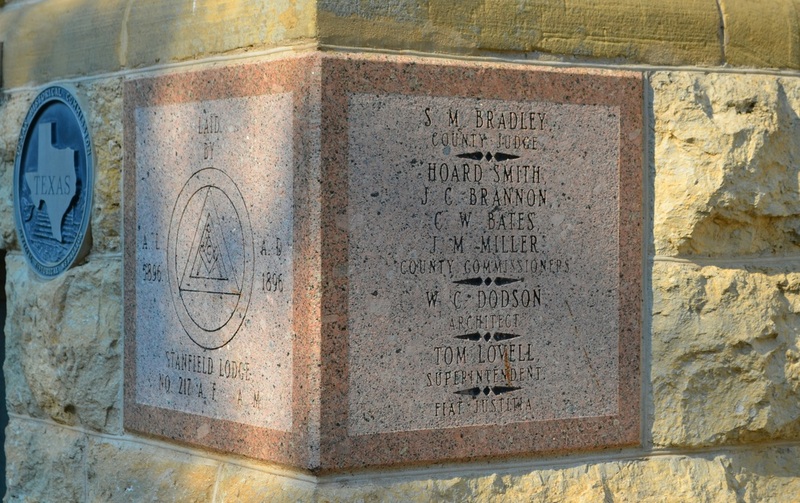 A county seat, named Pinckneyville, was located near the center of the county, at a spot about a mile southeast of the present center of Denton. seat near the center of the county on a 100-acre tract donated by Hiram Cisco, William Loving, and William Woodruff. 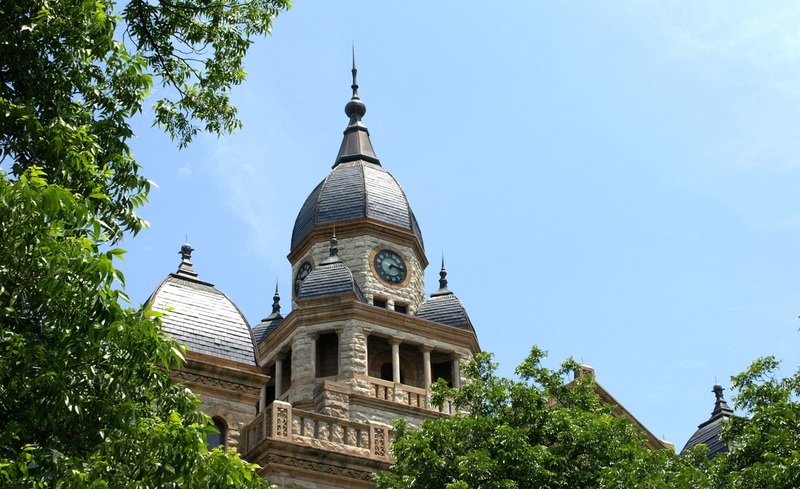 The new town, named Denton, was established the next year, but was not incorporated as a city until 1866." I visited the county and photographed the courthouse on Wednesday, June 2, 2010, and again on Thursday, June 28, 2012. The courthouse seen from the TWU campus. 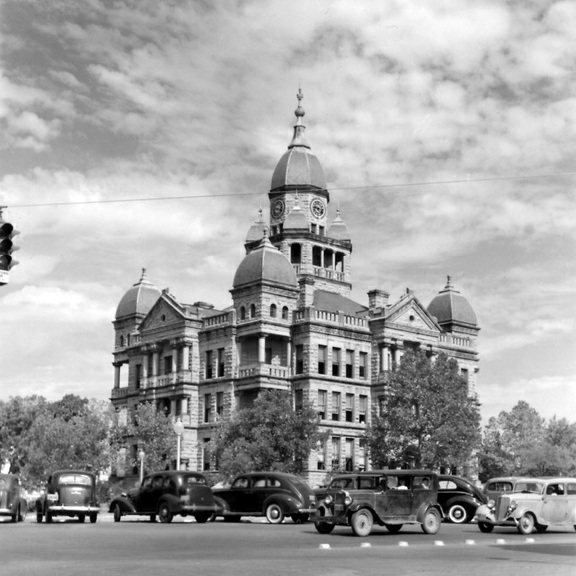 Denton County courthouse, circa 1939, courtesy TXDOT. 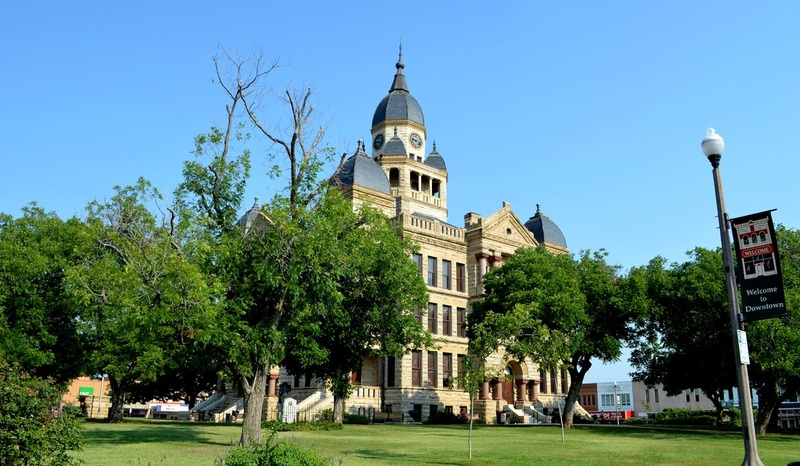 "On July 3, 1895, the Commissioners' Court authorized the construction of a new building specifying 'the Romanesque style of Architecture for the Denton County Courthouse as shown in the design prepared by Architect J. R. Gordon. Subsequent study of Gordon's plans resulted in his discharge for some reason not recorded. The commission was then awarded to architect W.C. Dodson who was ordered to prepare plans, specification and details, as well as to supervise construction by contractor Tom Lovell." 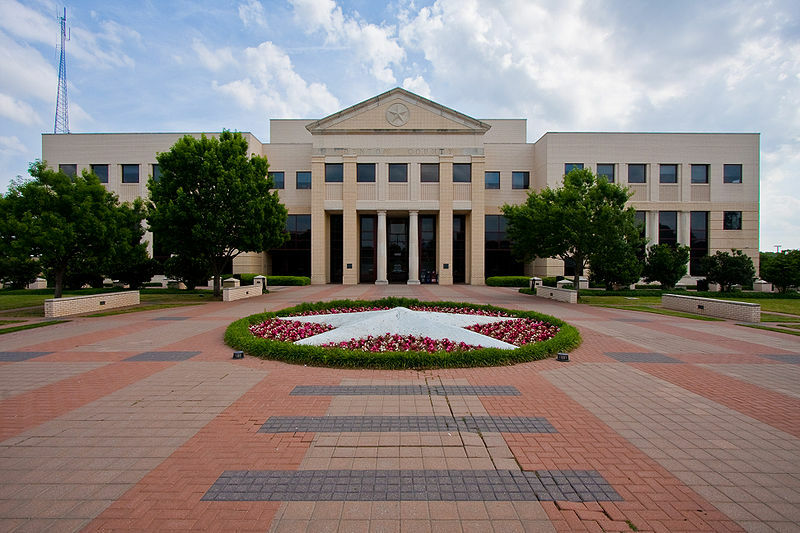 "Centered in the public square atop an eminence, the Denton County Courthouse is comprised of a group of imposing masses. Each façade consists of a five part composition with a projecting pavilion emphasizing the entrance. Each entrance pavilion is enriched by a Roman- arched opening, two ranges of columns and a triangular pediment. At each corner is a series of balconies surmounted by a tower with an ogival roof. "The dominant feature of the composition is the central octagonal tower rising above a broad platform with four ancillary domes, a composition which was most certainly inspired by the dome of the Cathedral, Florence Italy (1296). The central tower is the best feature of this building. I'm not a fan of this building. I believe the proportions and massing are awkward. The "open" corner balcony supporting a "heavy" masonry tower doesn't work. The new Denton County Courts building has replaced the 1896 courthouse which is now used as a museum and offices, with limited courtrooms.